Puglia has long since been a favoured holiday destination for the Italians who come, largely in July and August, for the incomparable turquoise sea and unspoilt beaches, and for the excellent food and wine. In the last few years it has increased in popularity with the British and Americans, but is a long way off being ‘touristy’, tending to attract the more discerning traveller. It is well worth a visit at any time of year however. The food and wine are outstandingly good and, relative to elsewhere in Europe, inexpensive. Visitors to Puglia are almost invariably overwhelmed by the food, both in terms of its quality and quantity! The freshest fish and seafood, vegetables bursting with colour and flavour, local cheeses, fantastic bread, fresh pasta and baked products and, of course, the incomparable olive oil and wines. Natural beauty abounds, whether you are driving through a landscape dotted with olive and fruit trees, divided up by dry stone walls, or admiring a crystalline turquoise sea from a cliff top vantage point, or lying on a white sand beach. There are architectural gems as well, from the perfect, simple medieval chapel to the full blown Baroque cathedral and everything in between. There are castles, towns with winding cobblestoned streets and white washed medieval houses, harbours with brightly coloured fishing boats and more sophisticated marinas with visiting yachts. You can ride, sail, windsurf, play golf on a championship course, walk, explore by bicycle, have cooking lessons, help with the grape or olive harvests, visit wineries or simply relax. The way of life is slow and relaxed, the people are friendly and often very welcoming and helpful because they are genuinely thrilled that foreigners want to see ‘their’ Puglia. Above all, with a few exceptions, Puglia is a ‘real’ place. In Bari, the little old ladies still sit outside their houses making fresh pasta because they have always done so, rather than because it is appealing to tourists. The fishermen come back in with their boats, the market traders call out their wares and, in many cases, life continues as it always has. I particularly recommend visiting the area between Trani and Brindisi as it is less well known than the Salento area further south, and more unspoiled than, for example, the Gargano, while being also more accessible due to the advent of Ryanair flights to Bari and Brindisi airports. It also has a more varied landscape (the Salento is relatively flat and, in the summer, arid) and the combination of hills, valleys and plains, and the long coastline, give it an idyllic microclimate. The heat is seldom oppressive as you are never far from the sea and so there is usually a sea breeze. 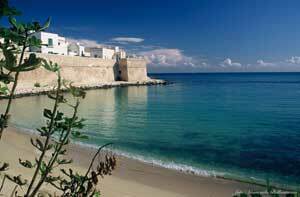 My first, and greatest, love though is Monopoli, where I live. There is something magical about the place, and the combination of pale golden sandstone, white wash, blue sky and turquoise sea never fails to lift my spirits. It somehow has the right combination of tranquillity and bustle. Even food shopping becomes a pleasure in the lively daily market and the surrounding shops; a quick visit to the butcher becomes a protracted discussion on the best ways to prepare a certain cut, the cheese shop insists you taste the cheese from their brother in law’s masseria and no-one enters a shop without saying buon giorno to everyone already in there.